Data fusion (DF) combines large amounts of information from a variety of sources and fuses this data algorithmically, logically and, if required intelligently, using artificial intelligence (AI). Also, known as sensor data fusion (SDF), the DF fusion system is an important component for use in various applications that include the monitoring of vehicles, aerospace systems, large-scale structures, and large industrial automation plants. 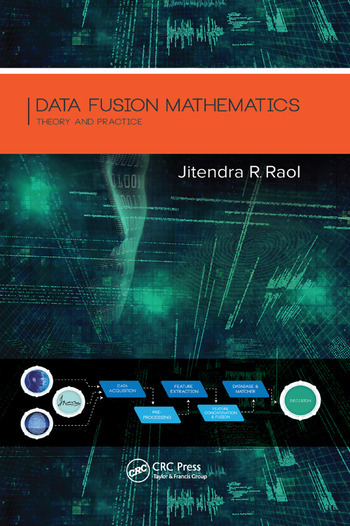 Data Fusion Mathematics: Theory and Practice offers a comprehensive overview of data fusion, and provides a proper and adequate understanding of the basic mathematics directly related to DF. The material covered can be used for evaluation of the performances of any designed and developed DF systems. It tries to answer whether unified data fusion mathematics can evolve from various disparate mathematical concepts, and highlights mathematics that can add credibility to the data fusion process. This text explores the use of statistical/probabilistic signal/image processing, filtering, component analysis, image algebra, decision making, and neuro-FL–GA paradigms in studying, developing and validating data fusion processes (DFP). It covers major mathematical expressions, and formulae and equations as well as, where feasible, their derivations. It also discusses SDF concepts, DF models and architectures, aspects and methods of type 1 and 2 fuzzy logics, and related practical applications. In addition, the author covers soft computing paradigms that are finding increasing applications in multisensory DF approaches and applications. Data Fusion Mathematics: Theory and Practice incorporates concepts, processes, methods, and approaches in data fusion that can help you with integrating DF mathematics and achieving higher levels of fusion activity, and clarity of performance. This text is geared toward researchers, scientists, teachers and practicing engineers interested and working in the multisensor data fusion area. Jitendra R. Raol received a BE and ME in electrical engineering from the MS University of Baroda, Vadodara in 1971 and 1973, respectively, and a PhD (in electrical and computer engineering) from McMaster University, Hamilton, Canada in 1986. He taught for two years at the MS University of Baroda before joining the National Aeronautical Laboratory in 1975. He retired in 2007 as Scientist G and head, flight mechanics and control division at CSIR-NAL. His main research interests are DF, system identification, state/parameter estimation, flight mechanics–flight data analysis, H-infinity filtering, ANNs, fuzzy systems, genetic algorithms, and soft technologies for robotics. "An application's guide to sensor fusion - Raol's comprehensive yet succinct handling of the mathematical fundamentals of sensor fusion make this a reference source for every practitioner." "… comprehensively presents tools for data fusions. Initial two chapters cover basic of data fusion and state estimations, especially Bayesian framework. The rest of chapters deal with advance topics that include fuzzy-logic based design, centralized and decentralized strategies, and image fusion. I feel the content of the book will useful both academia and industry."